Ward 6 Alderman Rebekah's Gewirtz's submission for the Board of Aldermen to consider a rules change to make the replacement of members of this Board subject to a time limited community review process when a vacancy occurs mid-term drew some strong words from Ward 5 Alderman Sean O'Donovan (0:38:00 timestamp) at last nigh's meeting of the full Board. After introducing her legislation and admitting a School Committee's decision initiated it, O'Donovan would comment that he thought the School Committee's decision to not accept the recommendation of outgoing Ward 1 representative Maureen Bastardi, but to conduct their own search of a candidate was "politically motivating" for some and have done that for their own "political gain." (0:39:28 timestamp). The process, as a whole, also does not sit well with O'Donovan who pointed out that the applications and resumes go to the Superintendant who then passes them on to the School Committee. O'Donovan feels the Chair of the School Committee should see the resumes and pass them along to members only as the Superintendant is an employee of the School Committee. He would state, "That information shouldn't even be in front of him." One could equate the process to that of an employee hiring their boss. Other members of the Board of Aldermen would comment that they were ready to discuss the proposal and that they had always felt comfortable with the process as the Ward Alderman would be the most knowledgeable of who would be the best candidate. They would also go on to support the appointment of Maureen Bastardi as she was voted to her position by the same process that elected Bill Roche. The order was referred to the Committee on Rules, newly established by President Bill White on the same agenda, where it will be discussed and passed back to the full board for voting. The School Committee begins special meetings on Monday to fill the vacancy of the Ward 1 seat with a 6pm meeting in the Aldermanic Chambers of City Hall. Their regular meeting begins at 7pm. Basically, if a Progressive Democrat on the School Committee stepped down and chose another Progressive Democrat, Gewirtz wouldn't have submitted this in. Plan and simple. They don't like the "old boy/girl" system because it forces them to run for office, rather than be selected but they would use the same system if it benefitted them...and they have. For a group that pushes transparency and public process I don't think they practice either which has and always will make them suspicious and not likely to get anymore elected in the future. Wholly agree. Neidergang pushed for this rules change on the school committee, and of course Gewirtz wants to be in his corner. But to the above Anonymous poster, if Gewirtz for whatever reason left Ward 6 Alderman, I'm certain Ward 6 would elect another progressive. 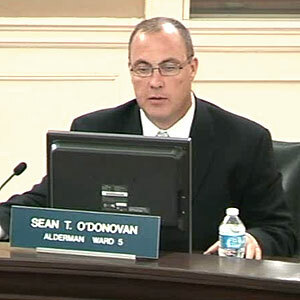 You know its an election year when Alderman O'Donovan starts "yelling" on an issue. In non-election years he lets others do his "yelling" for him.